SfDataGrid allows you to group the data against one or more columns. When grouping is applied, the data is organized into a hierarchical structure based on matching column values and it is sorted by ascending order. You can allow end-user to group the data by setting SfDataGrid.AllowGrouping property to true , where user can drag and drop the column into GroupDropArea to group based on that column. When the column is grouped, records that have an identical value in the column are combined to form a group. The GroupDropArea can be enabled by setting the SfDataGrid.ShowGroupDropArea property to true. 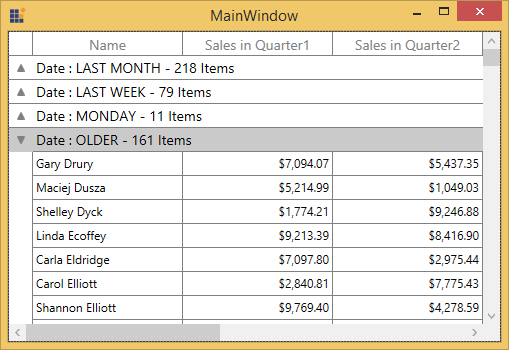 You can enable or disable grouping on particular column by setting the GridColumn.AllowGrouping property. GridColumn.AllowGrouping takes higher priority than SfDataGrid.AllowGrouping. The data can be grouped by an unlimited number of columns. To group more than one columns, drag-and-drop the desired columns in to GroupDropArea. Each group is identified by its CaptionSummaryRows and it is used to organize the data into a hierarchical tree structure based on identical values of that column. The underlying records in each caption summary row can be expanded or collapsed by clicking its group caption. Each CaptionSummaryRow carries information about a particular group like group name, number of items (records) in the group, etc. You can refer Caption Summaries section, for more information about CaptionSummaryRow. SfDataGrid allows you to group the data programmatically by adding or removing GroupColumnDescription to SfDataGrid.GroupColumnDescriptions collection. For example, if you want to group the OrderID column programmatically, define its MappingName to ColumnName property of GroupColumnDescription. Then add the GroupColumnDescription to the SfDataGrid.GroupColumnDescriptions collection. You can group more than one column programmatically. 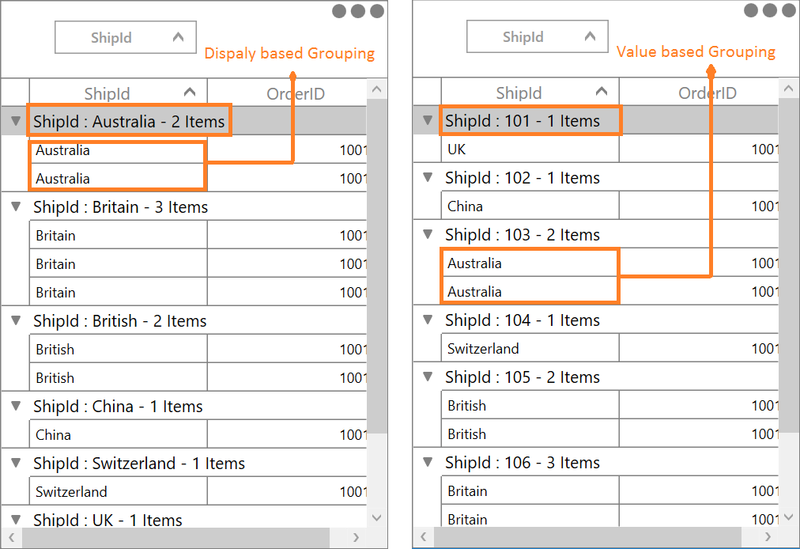 You can group the column in SfDataGrid based on the value being displayed in cell by setting GridColumn.GroupMode as ‘Display’. 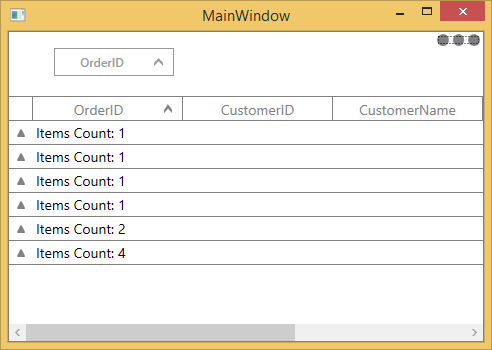 In the below example, OrderID column displays value with one decimal digit in cell. But when you group, groups will be created based on actual value considering all decimal digits of value (Refer right side screen shot). You can group based value displayed in the cell by setting GridColumn.GroupMode as ‘Display’ (Refer left side screen shot for the same data). 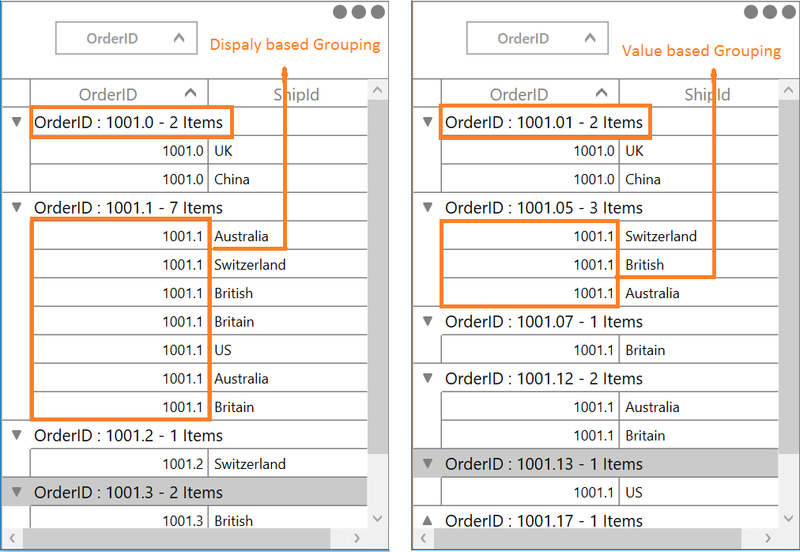 In SfDataGrid, you can group the column based on display value and also the same can be displayed in caption summary by setting GridColumn.GroupMode as ‘Display’. You can remove all the groups by clearing SfDataGrid.GroupColumnDescriptions collection. You can ungroup the column programmatically at runtime by removing GroupColumnDescription from SfDataGrid.GroupColumnDescriptions collection. 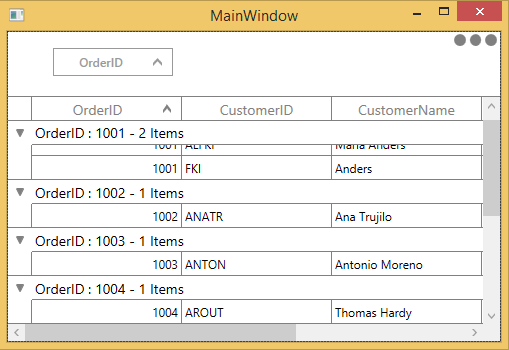 To ungroup the column in UI, click the close button on column header or drag the column header from the GroupDropArea and drop it on the header row. 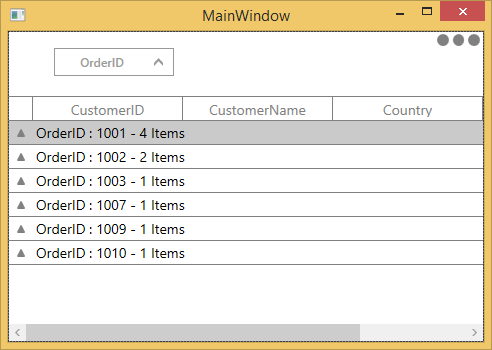 You can hide the column header when the particular column gets grouped by setting SfDataGrid.ShowColumnWhenGrouped property to false. You can freeze the group caption of the group in view until its records scrolled out of the view by setting the SfDataGrid.AllowFrozenGroupHeaders property to true. By default, you can view the records in each group by expanding or collapsing its group caption. You can allow end-user to expand or collapse the groups programmatically at runtime. You can expand all the groups while grouping by setting SfDataGrid.AutoExpandGroups to true. 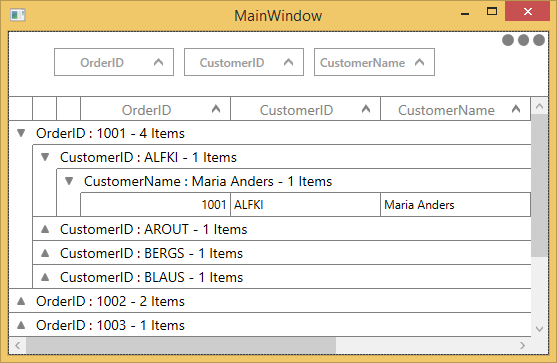 So, when user group any column, then all groups will be in expanded state. You can expand or collapse all the groups at programmatically at runtime by using SfDataGrid.ExpandAllGroup and SfDataGrid.CollapseAllGroup methods. You can expand or collapse the group based on its level by using SfDataGrid.ExpandGroupsAtLevel and SfDataGrid.CollapseGroupsAtLevel methods. You can expand or collapse specific group by using SfDataGrid.ExpandGroup and SfDataGrid.CollapseGroup methods. You can customize the width of IndentColumn in SfDataGrid by using IndentColumnWidth property as like below. You can change the GroupDropArea’ s text can by setting SfDataGrid.GroupDropAreaText property. GroupDropAreaText="Drag and drop the columns here"
SfDataGrid allows you to customize the appearance and height of GroupDropArea by writing the style of TargetType GroupDropArea. By default, the GroupDropArea will be expanded while dragging the column towards the GroupDropArea. You can set the GroupDropArea to be always expanded by setting the SfDataGrid.IsGroupDropAreaExpanded property to true. SfDataGrid allows you to group the data based on custom logic when the built-in grouping functionality doesn’t meet your requirement. To perform custom grouping on a particular column , specify the custom logic through GroupColumnDescription.Converter property and the column name to GroupColumnDescription.ColumnName property. For an example, the Date column is grouped based on the week basis in the following example. Now , assign the GroupDateTimeConverter into GroupColumnDescription.Converter and set Date property to GroupColumnDescription.ColumnName property. 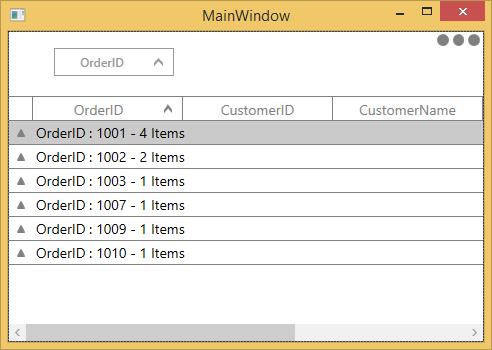 You can refer here to apply custom sorting when grouping is applied. sorted based on the column name described in GroupColumnDescription. 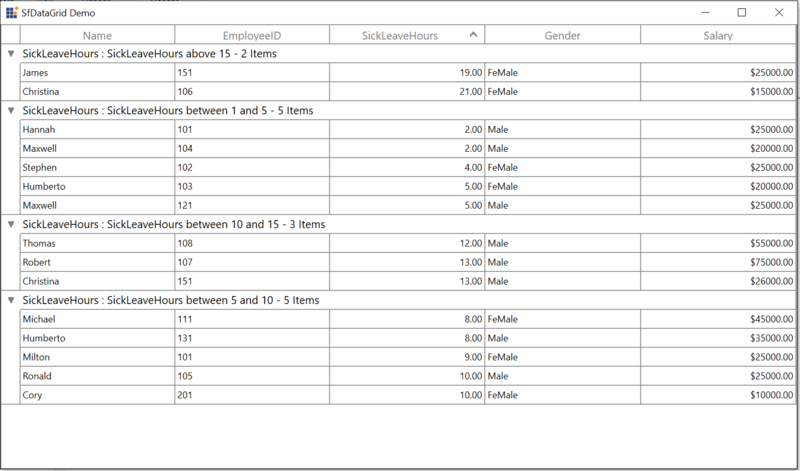 In the below screenshot custom grouping is applied based on SickLeaveHours column and the inner records in each group are sorted based on SickLeaveHours value. SfDataGrid allows you to sort the groups based its summary values. You can sort the groups based on summary aggregate value by using SfDataGrid. SummaryGroupComparer property. Follow the below steps to sort the groups based on caption aggregate value. In the below code snippet, the OrderID column compared and sorted based on the number of order count in each OrderID. Custom group comparer can be defined in SfDataGrid using SfDataGrid.SummaryGroupComparer property. SummaryGroupComparer maintains the custom comparers and the custom comparer gets called when corresponding column is grouped. You can download the sample demo here. The SfDataGrid.GroupExpanding event occurs when the group is being expanded. The GroupChangingEventArgs of the GroupExpanding event provides the information about the expanding group and it has the following members. Group - Gets the group that’s being expanded. Cancel – Decides whether to cancel the group expansion. You can cancel the group expansion by setting GroupChangingEventArgs.Cancel to true. The SfDataGrid.GroupExpanded event occurs after the group is expanded. The GroupChangedEventArgs of the GroupExpanded event provides the information about the expanded group and it has the following member. Group - Gets the expanded group. The SfDataGrid.GroupCollapsing event occurs when the group is being collapsed. The GroupChangingEventArgs of the GroupCollapsing event provides the information about the collapsing group and it contains the following member. Group - Gets the group that’s being collapsed. Cancel – Decides whether to cancel the group collapsing. You can cancel the group is being collapsed by using GroupChangingEventArgs.Cancel of GroupCollapsing event. The SfDataGrid.GroupCollapsed event occurs after the group is collapsed. GroupChangedEventArgs of the GroupCollapsed event provides the information about collapsed group and it contains the following member. Group - Gets the collapsed group.